mybatis – Java, SQL and jOOQ. And the above list is far from being exhaustive. Transaction management is something very delicate, and it certainly should not be imposed by a library whose main purpose is not transaction management, because any such library / framework will provide you with at most a very leaky abstraction of its transaction model. In other words, if you just slightly want to deviate from “the standard” model (e.g. as imposed by Hibernate), you will suffer greatly, as soon as you want to run 2-3 queries outside of Hibernate – e.g. batch or reporting statements through jOOQ. MyBatis is a SQL templating engine that provides a couple of features on top of alternative templating engines, such as Velocity, or StringTemplate. One of these features built on top of templating is precisely transaction management, as can be seen in the docs. From what we can read in the docs, it looks as though MyBatis’ transaction managers can be overriden by Spring, for instance. However, it is not easy to see how this is done. In fact, given that MyBatis also solves Connection pooling (for which there are also very viable alternatives, such as c3p0 and DBCP), and mapping (which could be solved more easily with custom transformers, such as offered by Spring’s JdbcTemplate, or jOOQ’s RecordMapper). As many frameworks, MyBatis tries to solve problems outside its core scope, which is SQL templating. While this may be a good thing as you only rely on a single dependency, it is also quite a lock-in, in case you have a more complex model. In the case of transaction management, we believe that this was not a good idea by MyBatis. jOOQ is an internal domain-specific language modelling SQL through a Java fluent API. MyBatis is an XML-based SQL templating and mapping engine where dynamic SQL can be created through an XML-DSL. The separation of Java and SQL code, extracting SQL code into external files. This allows DBA to patch SQL strings in productive environments, adding hints, and other tuning. The automatic mapping of tabular result set data to objects. This too is achieved in the same XML DSL as the dynamic SQL specification. Very simple glue code. As you’re in full control of your template engine implementation adapter, you can also add caching, object pools, etc to your adapter. Among the above, all tools ship with a simple, proprietary template language, but jOOQ is the only one encouraging you to use your template engine of choice and thus offering arbitrary templating extensibility in the future. High Complexity and Low Throughput. 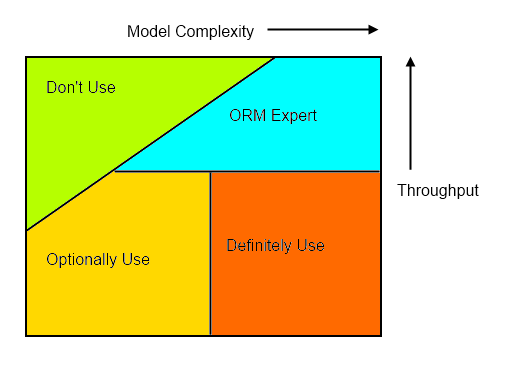 Reasons for Using an ORM. The ORM or not ORM topic will probably never stop showing up on blogs. Some of them are more black and white, such as Jeff Atwood’s Object-Relational Mapping is the Vietnam of Computer Science others are more “50 shades of data access”, such as Martin Fowler’s ORM Hate. I’m personally impressed by the work ORMs have done for us in times when repetitive SQL started to get boring and CRUD was not yet established. But ORMs do have their caveats as they are indeed leaky abstractions. The aforementioned article shows in what situations ORMs can pull their weight, and in what situations you better keep operating on a SQL level, using tools like jOOQ, MyBatis, Apache DbUtils, or just simply JDBC. Now here’s one of the most wicked API’s I’ve seen in a while! … jeez, that is one of the funniest ideas I’ve ever seen. A ThreadLocal to keep the SQL statement currently being rendered!! And an API just … err … adding Strings to an internal StringBuilder? Wow. jOOQ rocks! We implemented a large scale ETL service with it, and couldn’t be happier. I’ve used iBATIS, and jOOQ gives all the same advantages of low level SQL without the reams of XML and lack of type safety. […] one of the best features of jOOQ: Complex and/or dynamically generated queries can be assembled in a controlled way and verified by the Java compiler, saving you from all those ambiguous syntax errors databases throw, and providing compile-time regression coverage for when the schema changes under you.